1961-1964 was an exciting period for California Chess. This volume of the California Chess Reporter starts with the 1961 US Open in San Francisco won by Grandmaster Pal Benko with the overwhelming score of 11-1 by beating California State Champion Zoltan Kovacs in the last round. 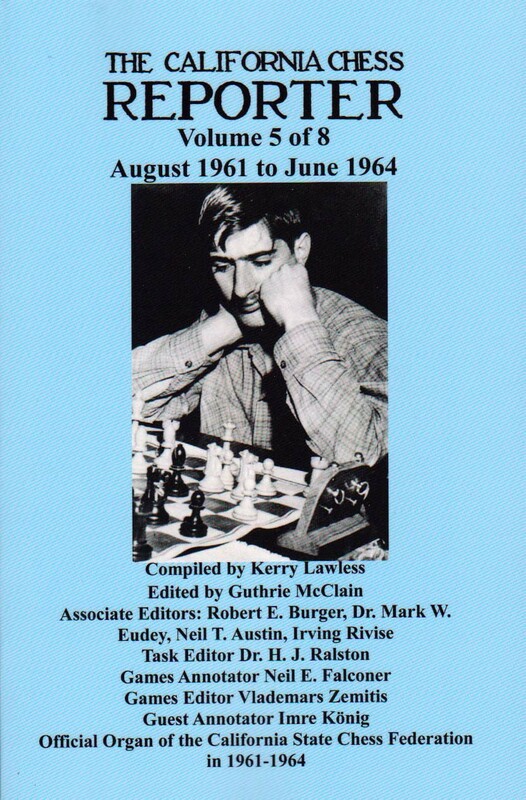 This volume concludes with the famous simultaneous exhibitions given by Bobby Fischer in 1964. Among the developments in 1961-1964 was the rise of William Addison as California's strongest player. Although Addison had long been recognized as a master, he was until 1962 just one of many. Suddenly, in 1962 Addison just started winning everything, often with Fischer-like clean sweeps, winning all the games with no draws and no losses. Soon thereafter came the rise of a great new talent. A strange young boy named Duncan Suttles, with no formal chess training and unusual ideas about the openings, started beating everybody by playing with Black the following sequence of moves g6, Bg7, f6, Nh6, Nf7, O-O. From this peculiar formation, Suttles would launch a powerful attack and wipe out everybody. His picture is on the cover here. As a result, the two best players in the state were Addison and Suttles. Their showdown came in the May 1964 Stamer Memorial shown on page 407 here. Their game is shown on page 417, where Suttles as White played his Suttles System in reverse. The result was that Addison won. We spent hours and hours going over that game and were never able to solve it. Another strong player, Anthony Saidy, moved from New York to Los Angeles and started winning most of the tournaments in Southern California. Dr. Saidy arrived in mid-1962 to be a medical intern, winning the Pacific-SouthWest Open on the same day that Marilyn Monroe died. This of course provided his alibi. Saidy later won the Steiner Chess Club Championship, He was at that time the highest-rated player between Novosibirsk and Indianapolis on the Pacific Route. The 1963 Piatigorsky Cup was held with eight of the strongest players in the world competing. The result was a tie for first between Paul Keres and Tigran Petrosian. In 1962, the United States Chess Federation decided that for the sake of diversity a California player would be allowed to play in the US Championship. Many New Yorkers objected, saying that the California players were too weak. Nevertheless, only for the sake of appearance, they let one California player into the US Championship. Addison was sent. Everybody in New York thought this California guy would finish last. The world was shocked when Addison beat World Championship Contender Samuel Reshevsky in the very first round..
Kerry Lawless has been working for years and years, at least 25 years that I know of and probably a lot longer than that, on compiling every game he can, published and, where possible, unpublished that has ever been played in the State of California. The result of this great work is his website ChessDryad.com and his database calgames.pgn that contains at present 37,598 games, all played in the State of California from 1856 to the present. All of the games in California Chess Reporter here are also in his downloadable calgames.pgn database but in Algebraic Notation. Kerry Lawless has also been making great efforts to compile all chess publications published in the State of California and, as much as possible, all articles about California chess. One result of these efforts is he has compiled every issue of the California Chess Reporter during its 25 year run from 1951 to 1976. At great personal expense to himself he has had all these volumes bound by a professional binding service. These bound volumes created by Kerry Lawless have been used to make these reprints.